I’ve been poking around Oakland’s edges lately. In southernmost East Oakland there’s not a lot of geologic history, but there are some big old trees, survivors of optimistic times, plus nice views of the hills and sky. 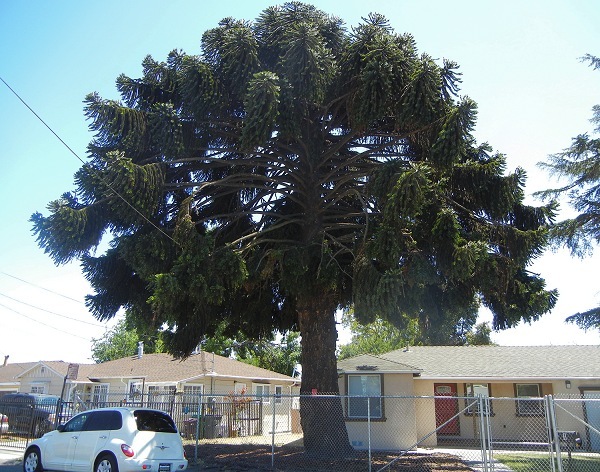 And here’s an even more exotic visitor, an Araucaria from the southern hemisphere (a monkey-puzzle tree, I think) in Sobrante Park. 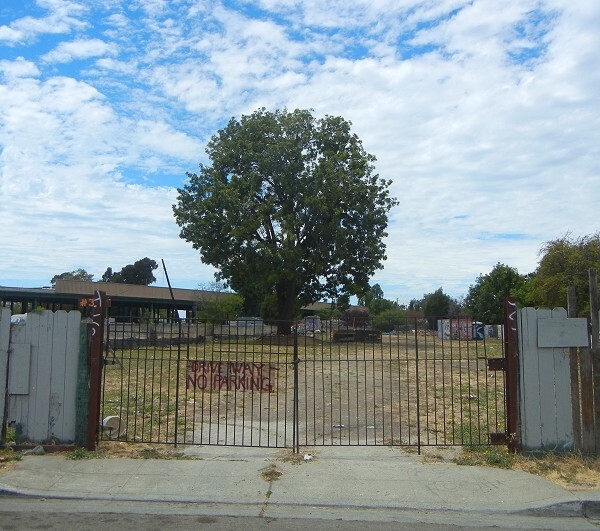 On 105th Avenue, next to what appear to have been Oakland’s last commercial greenhouses, we have a big old lot where there used to be something but now there’s just a large generic tree. What has it survived? The ground here is mapped as Bay mud, just past the seaward edge of the alluvial fan of San Leandro Creek. If the soil is still clean, it should be rich stuff. Down at the end of 105th Avenue, hard by San Leandro Creek, is a cluster of venerable black walnuts. Unlike the previous trees, these may well be natives. At least the species is right and the riparian (streamside) habitat is correct. 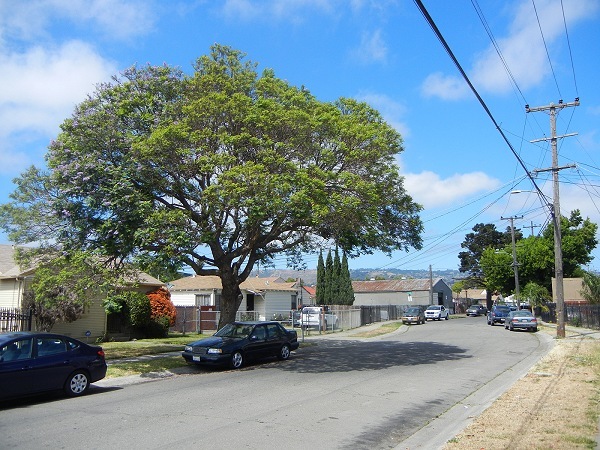 There are surely people in Oakland who remember the stories of these trees. But I really wanted to talk about another old survivor tree, up in the hills on the south side of Horseshoe Canyon. In fact “Old Survivor” is its name. This last week I had the opportunity to visit it with a small group of people. It’s older than any human memory in these parts. The group tended to refer to the tree as “the Grandfather Tree.” I thought “Grandmother” was a name just as good. But the DAR, in chiseling “Old Survivor” on this monument by Campus Drive at Carl Munck Elementary School, established priority. The age is subject to revision, though. The 1981 monument put the tree’s age at 425 years, but there’s no birth certificate for this baby. 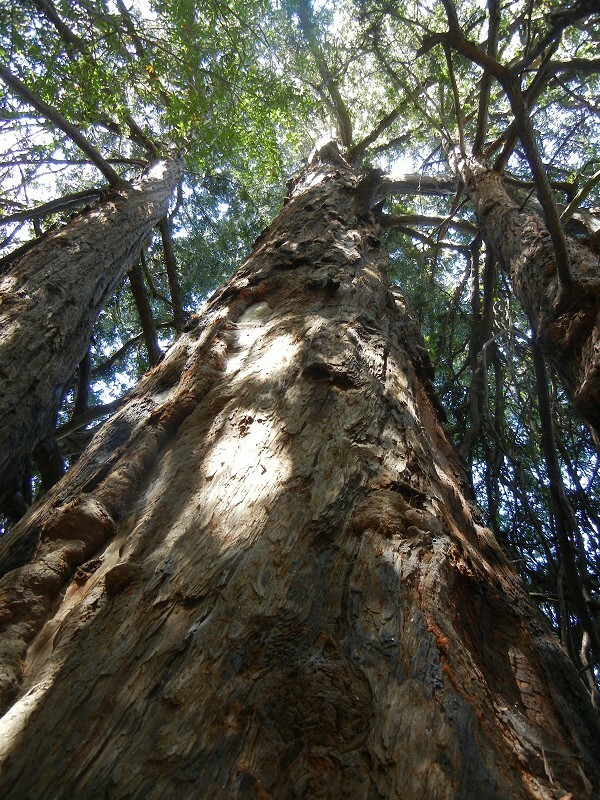 The tree was cored in the late 1960s, and its age at that time was estimated as 415–420 years. Let’s make 1550 its germinal year. So today it would be 465 years old. Here it is. 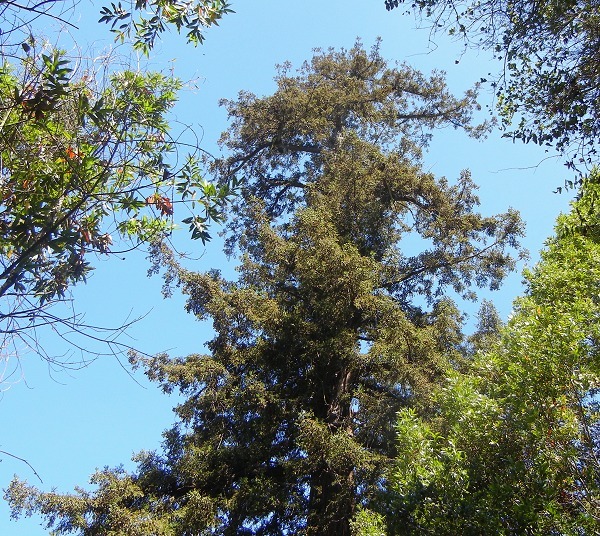 The Old Survivor is about 100 feet tall and has presence, especially when you think of it as the last old-growth redwood left in its East Bay stronghold. However, the loggers let it be because it was, and is, a scraggly, marginal specimen. Part of its uphill side is bare, fire-scarred wood. It’s flanked by two nuisance trunks that were less than marketable size in the 1850s redwood rush. The slope it sits on is more of a cliff, and had it been toppled it would have shattered. 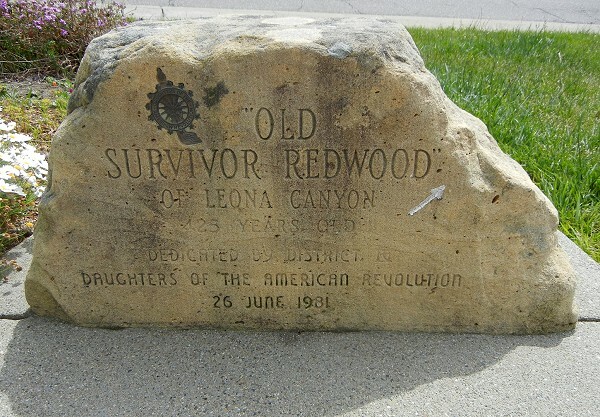 The Old Survivor is rooted on Leona “rhyolite” rather than the moist mudstone of the Redwood Formation or Oakland Conglomerate that redwood prefers. 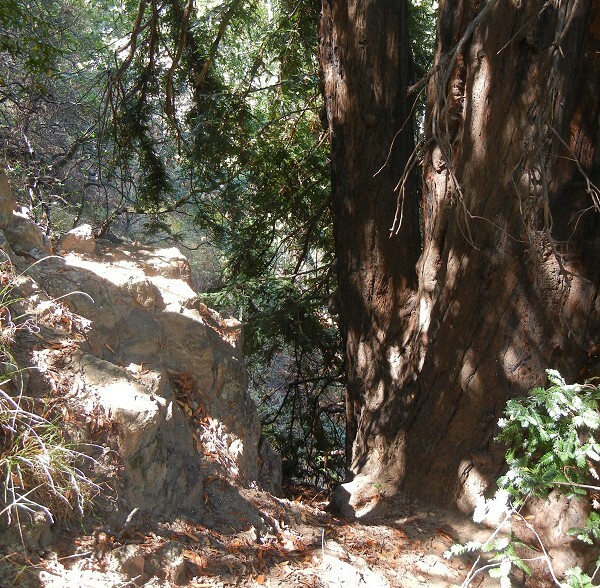 But it’s fitting that Oakland’s oldest tree grows from Oakland’s oldest rock. 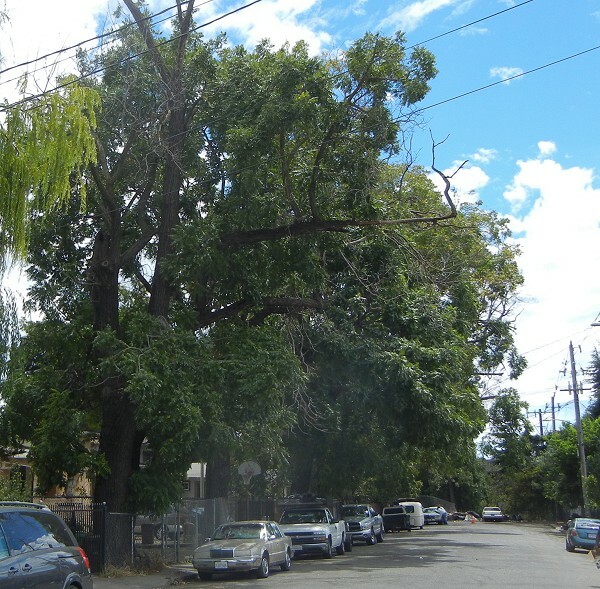 While the tree consists of a triple trunk, the central trunk stands above its siblings pretty well, if I can judge from the photos on oaklandwiki. I took a photo of its crown from the west side. Old Survivor isn’t pretty, and it’s very hard to visit, but it’s still precious: the last bit of our forest primeval. This entry was posted on 10 August 2015 at 8:02 am and is filed under Leona volcanics, Other topics. You can follow any responses to this entry through the RSS 2.0 feed. You can skip to the end and leave a response. Pinging is currently not allowed. Good to see such long time trees, especially after this morning’s “shake” – thanks. That Araucaria is native to southern Argentina and Chile, mostly in the Andes but with a few stands in the Chilean coastal ranges.